Construction on Texas roads never seems to end, given the sheer size of the state and the miles of pavement that must be maintained and repaired. All of this construction is beneficial in the long run, as it keeps existing roads in good shape and adds additional lanes to ease congestion. In the short run though, construction work zones can be extremely dangerous both for the people who work in them and the motorists who must travel through them. A collaborative effort has been made by the federal government and many state governments to decrease the number of work zone accidents across the country over the past few decades. While the effort has been somewhat successful, even one death or injury attributable to a work zone crash is too many. There were 14,617 car accidents in Texas work zones during 2010, according to figures released by the Texas Department of Transportation. Those collisions caused 115 fatalities, 2,965 serious injuries and 5,208 non-serious injuries. If you or a loved one has suffered a catastrophic injury in a work zone accident in Southeast Texas, contact Houston personal injury lawyer Kevin Krist today for a free consultation about your case. You can reach the Law Office of Kevin Krist by calling 281-677-3960, or use our firm’s online form. You’ll hear back from Mr. Krist within 24 hours. If you hire Kevin Krist as your personal injury attorney, you can be assured that he will be the lead attorney on your case from start to finish. Kevin Krist provides personal representation to every injury client he represents. Mr. Krist is ready to put his skills and experience to work on your case today. Speeding – Speeding is such a serious problem in highway construction zones that the legislatures in many states, including Texas, have raised the cost of speeding tickets in work zones. Despite the stiffer penalties, many drivers fail to slow down for road construction, putting workers, other motorists and themselves at risk. Aggressive or reckless driving – Aggressive driving encompasses a wide range of dangerous driving behaviors, all of which can significantly increase the risk of an accident in a work zone. 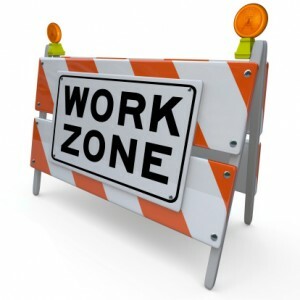 Actions such as following too closely or unsafe passing are even more dangerous when they take place in a work zone. Distracted driving – Driver distraction is a leading cause of all crashes throughout the country, due in large part to the increased use of electronic devices such as cell phones and GPS devices. A driver who is texting while driving or trying to read a navigational device can easily miss the cues that he or she is entering a work zone. Impaired driving – Despite considerable efforts in recent years to warn drivers about the dangers of drinking or using drugs while driving, impaired driving accidents still happen all too frequently. A driver who is under the influence of drugs or alcohol may not recognize the need to change lanes or slow down for a work zone. Drowsy driving – A fatigued driver can begin to drift off while driving. If that driver comes upon a work zone, he or she may be too fatigued to follow the directions intended to help motorists navigate the construction. In order for the victim of a motor vehicle accident to be entitled to compensation for injuries sustained in the crash, another party must be determined to have been negligent, or at fault, in the collision. The exception to this general rule is when the victim was working at the time of the accident. In that case, workers’ compensation insurance may cover the injuries. When the victim was an occupant of a vehicle, however, the issue of negligence is a critical component of recovering damages for injuries sustained in the collision. In a work zone accident, the attribution of negligence can become complicated. Often, more than one driver shared in the fault for the accident. Moreover, the construction company and/or the governmental entity responsible for the roadway may also share in the blame for the accident. Because negligence can be a complex issue in a Texas work zone accident, it is even more important that the victim consult with an experienced car accident attorney to determine who is responsible for his or her injuries and pursue a claim against the responsible party. If you or a loved one has suffered a catastrophic injury in a car accident in a work zone in Southeast Texas, contact a Houston personal injury lawyer at the Law Office of Kevin Krist at 281-677-3963, or through the firm’s online form. Let Kevin Krist explain how he can put his proven experience to work for you so you can get the compensation you deserve for the injuries you suffered because of someone else’s carelessness. Kevin Krist represents accident victims on a contingency fee basis, which means you pay no fees until he recovers compensation on your claim.